One of the fun things to think up for a tea party is the favors. I'm no expert, but thought I would share some of the favors my friends and I have come up with before. Please excuse the poor lighting in the pics. The little flower pots contained a packet of seeds, 2 kinds of flower bud teas, and a card with a tea poem inside. And for the little girls (sorry - I don't have one to show you) we painted mini clay pots with chalkboard paint and filled them with a flower frame craft, chalk and a piece of felt for their pot, and candy - I think. 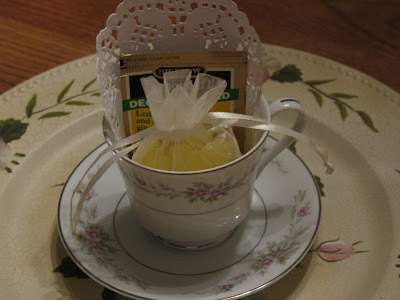 Each lady got to pick her own teacup which contained a lemon teabag and lemon drops. 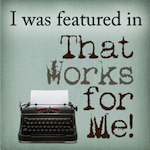 The teacup was part of the favor - I'll talk about that at the end. 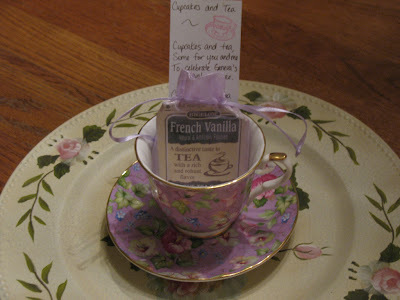 The cups included a bag with French Vanilla tea and a bookmark with a cupcakes & tea poem. These also included a piece of ferraro rochet candy (they kind of look like little cupcakes), but I don't have a piece sitting around! The teacup was again included as a favor. 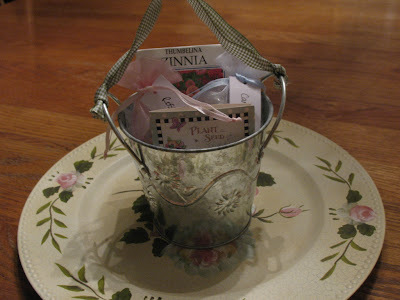 Favors can be as simple as a little bag with a teabag and a piece of candy, or something creative that fits with the theme. Tea accessories might be nice, or a handkerchief, or I have heard the idea of little books. My favorite places to hunt down favors are the thrift stores. What the ladies seem to enjoy the most is getting their own teacup as a favor. I have done this (with help) a few times now and always come up with enough cups and saucers for all. I search the thrift stores and yard sales, if time. I try to keep a goal of not paying more than $1 for each cup and saucer, and have even found them for 50 cents! Good Will has been great for me - I look at the individual cups and individual saucers and search for the matches (surprising how often they are there). It costs less than if they have already paired them up. My son loves to help me "hunt" for the matches! 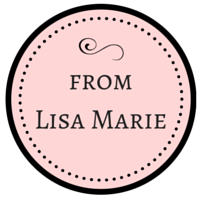 I hope this helps give you a few ideas for favors if you have to plan any parties. Have a lovely tea-filled Two-sday! Oh how wonderful! Don't you just love doing things like that? I know I do. Very nice. That is so cute and clever. I wish I had such a creative bone in my body like you do. 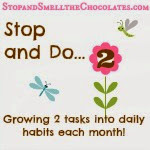 I have found my chocolate recipe so when you do that linky thing again, tell me how to do it, and I have a really good recipe for you. (you probably already have it, but I just had the cake this weekend and made my mom give me the recipe for it because of YOU.) she laughed at me! Oh well.